People often ask me about okra slime. Rarely do they ask for a good chocolate and okra recipe, which I will share unbidden. 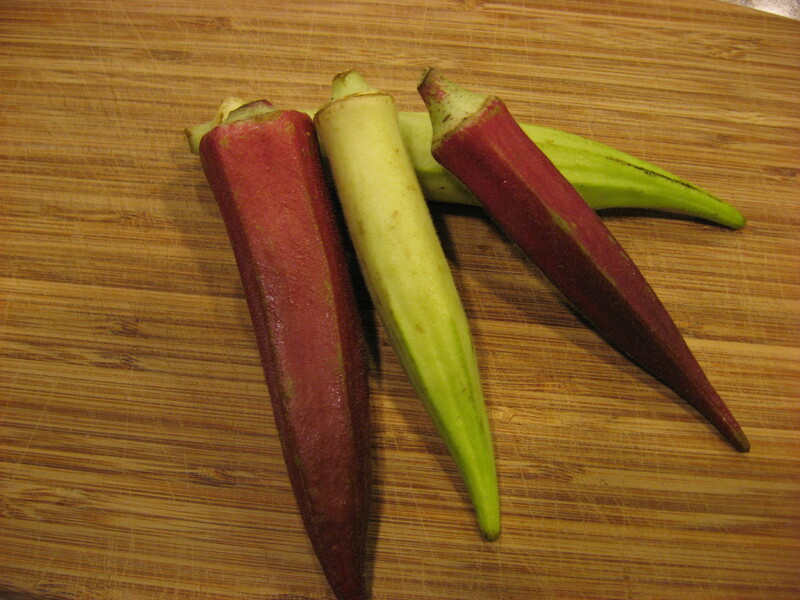 With or without the chocolate, though, okra is a tasty vegetable. The fruits can be fried, pickled, roasted, sautéed, and stewed. Young leaves are also edible, although I have never tried them and have no recipes. Okra fruits are low in calories and glycemic index and high in vitamin C, fiber, and minerals. The plant grows vigorously and quickly in hot climates, producing large and lovely cream colored flowers with red centers and imbricate petals. The bright green or rich burgundy young fruits are covered in soft hairs. When they are sliced raw, they look like intricate lace doilies. In stews, the slices look coarser, like wagon wheels. And yes, okra is slimy. 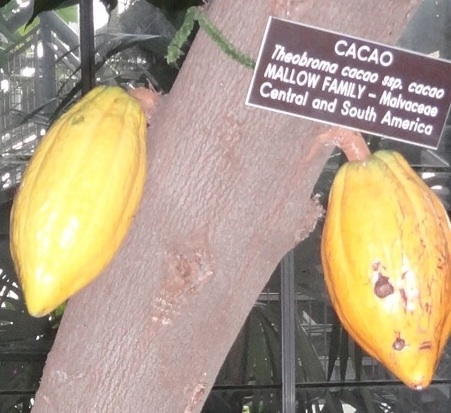 And it is in the mallow family (Malvaceae), along with cotton, hibiscus, durian fruit, and chocolate. Okra is slimy because it produces a water-soluble acidic polysaccharide (in the galacturonorhamnan group) more generally called mucilage, that forms a complex mixture with proteins and minerals. It’s not snot: animals make a glycoprotein-based complex mucus, whereas plants make mucilage. Okra mucilage is produced in large specialized cells scattered throughout the plant body, and it pours forth from chopped pods, clinging persistently to knives and cutting boards. Although okra slime is soluble in water, it does not dissolve quickly, and it leaves an odd slick feeling on your hands and dish sponge. Some people add okra mucilage to homemade paper to make it strong and smooth. Others have been testing its use as a vegan snot substitute, useful for delivering drugs nasally. Mucilage from the root of a close relative, the marsh mallow Althaea officinalis, was an original ingredient of marshmallows. Now marsh mallow root extract sometimes shows up in cosmetics and throat-soothing teas. Why does okra produce all that slime? You might suspect that mucilage repels herbivores, since plant defense is often behind otherwise inexplicable plant compounds. We have talked about defense compounds in the cabbage and nightshade families, among others. In this case, though, the slime seems to deter only some humans, and not animals or microbes more generally. Instead, mucilage is all about lubrication and moisture. Basically all plant species produce a little bit of mucilage at the tips of their roots to ease movement through the soil, cultivate a microbial community, and prevent delicate root tips from drying out. The seeds of many species produce mucilage when they get wet, apparently to buffer moisture fluctuations and to bind themselves more tightly to the soil as they germinate. Flax, chia, and basil seeds make especially thick and slimy jackets when wet. Mucilage within leaves and roots of some species seems to help plants regulate the water content of their cells, although I have found no robust studies specifically testing its role in okra plants. This is a ripe area for research, since okra is an important food plant in south Asia and west Africa and is reputed to tolerate drought and salt well. 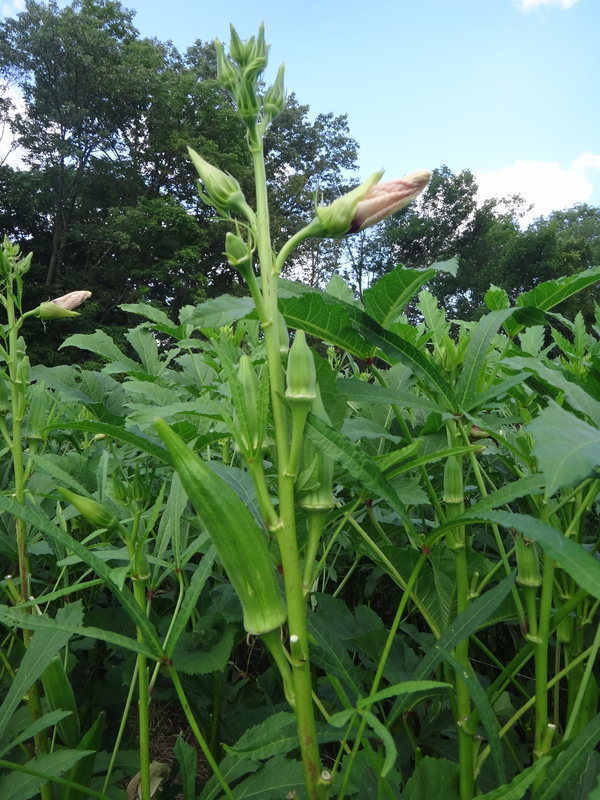 We may know very little about the functional role of mucilage in the life of an okra plant, but the scientific community knows a lot about its behavior under various culinary conditions (e.g. Woolfe et al. 1977). For example, viscosity peaks at neutral to alkaline pH. Adding a bit of baking soda to your okra soup will thicken the slime, whereas stewing it with acidic tomatoes – a classic pairing – will thin it. Heating over 90º C (close to boiling) reduces viscosity even when the dish is cooled again, probably because it denatures some associated proteins. So if you love your okra thick and slick, steam it lightly and serve it on its own or sauté it briefly and add (alkaline) eggs to the pan to make an omelette. If you care less about the slime than about the flavor and beauty of okra wheels, sauté your okra in a hot pan with onion and tomato or cook it in a tomato-based soup or stew. The ultimate acid treatment for okra is pickling. In New Orleans, even the vinegar-soaked and salted okra fruits are paired with tomato juice (and lemon juice and vodka, etc). Some cooks recommend working with absolutely dry okra and keeping the fruits whole to reduce the slime, as if slime were a misfortune visited upon the okra from somewhere outside. As we have seen, though, slime is made by cells within the fruits, and keeping okra whole will not prevent its spilling its mucilage all over your tongue when you bite through it. Cutting the okra and exposing it to water distributes the mucilage and increases its volume by thinning it, so the whole dish may seem more slippery. However, cutting it also exposes more of the mucilage to the slime-busting action of acid and heat. fruits left on a plant will grow to be about 8 inches long, develop woody fibers, dry out, and split lengthwise along and between the chambers that hold the seeds (locules). If you have ever tried to cut an okra fruit that is even just a tiny bit too old, you may have been surprised by the violent sound that comes from sawing through the tough flesh. Young tender fruits are an entirely different story. They are softly fuzzy, beautiful inside, and a joy to prepare if you can handle a slippery knife. 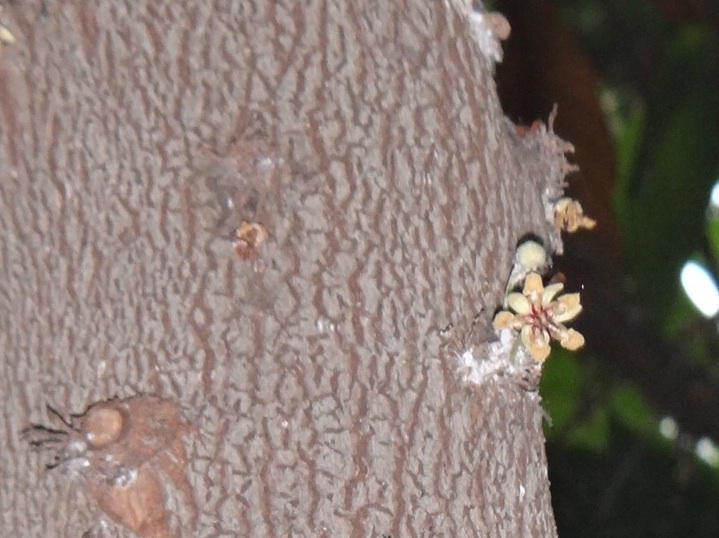 The little cap on one end is the base of the flower where the sepals, petals, and pollen-bearing stamens were attached. 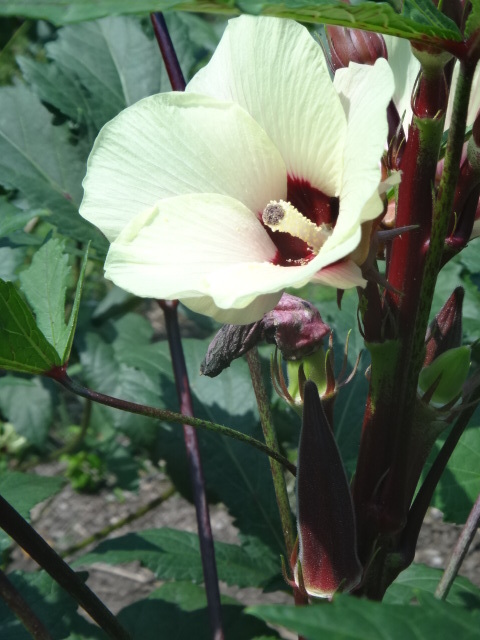 (Very fresh okra may still bear on the cap margins a few narrow pointed green bits that resemble sepals, but which are really bracteoles.) Some people eat the cap, but I find it tough and remove it. The fruit itself is five-sided, with thick walls and five open channels (locules) running from cap to pointed tip. The locules contain the seeds, which are spherical and typically fill the open space. 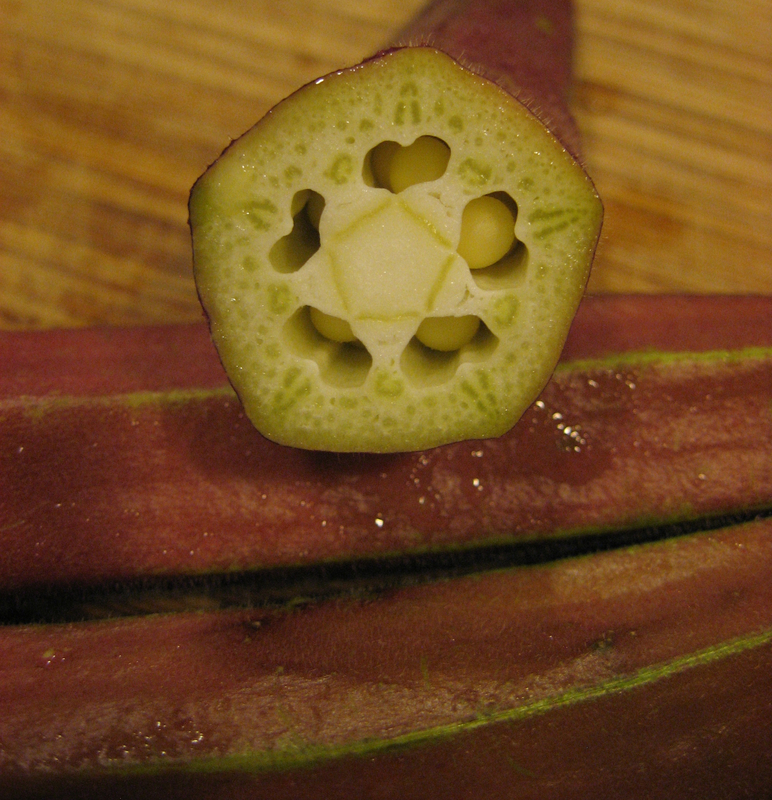 Okra slices look lacy in cross section because of their heart-shaped locules, large mucilage cells, and obvious vascular and support tissue. Mucilage cells are more or less scattered throughout the tissue, while the bundles of water- and sugar-conducting vascular tissues stand out against the pale background as c-shaped darker green areas. Young supporting fibers surround vascular bundles and lie just below the outer skin of the fruit. they grow directly from the trunks of large trees, not on small, fast-growing herbaceous plants as okra does. Indeed, cacao and okra used to be classified in separate closely related families, but genetic evidence has brought them together where they belong (Alverson et al. 1999), making sense of their obvious culinary affinity. In all seriousness, the flavor profile of okra includes bright floral notes along with something darker, like clove or wood smoke, and a hint of a bitter edge that resonates well with high-quality dark chocolate. My favorite pairing of okra and chocolate is fried okra with mole, and specifically Deborah Madison’s life-changing mole – a rich savory and sweet concoction of dried red pepper, onions, toasted spices, and dark chocolate. To begin, cut fresh young okra into pieces about as long as they are wide. Discard the cap-shaped receptacles and peduncles that attached the fruit to the plant. Count about a cup of okra per person. Toss the okra in flour. In a large bowl, beat with a fork enough egg to coat the okra. A large egg will barely coat a cup of okra. Add a bit of milk to thin the eggs if you need to stretch them. Toss the okra in the egg, making sure the egg sticks to all sides. In another large bowl, mix approximately equal parts flour, cornmeal, and bread crumbs. Add a pinch of salt to taste, but be conservative. Toss the egg-coated okra pieces in the cornmeal to cover. In a large cast iron skillet, heat enough canola or sunflower oil to cover the bottom of the pan about half the depth of an okra piece. Heat until a bit of coating sizzles rapidly in the oil. Cook the okra in the oil, turning the pieces, until the okra is fork tender. If the coating is burning, turn the heat down a bit. The okra does need to cook through, which can take over 5 mins. Drain on a paper towel. You may need to cook these in batches to keep them in a single layer. Serve the fried okra with a drizzle of mole and a nice dollop on the side. Fried okra is often served with hot vinegary tabasco sauce, which nicely complements the sweet corn and cuts the slippery okra, but can also overwhelm the okra flavor. Madison’s mole is not hot at all. Rather it is rich and shows off the fruit, smoke, and pleasant sourness inherent in good chocolate. It is strong enough to balance the okra goo while letting the unique okra flavors shine through. Alverson et al. (1999) Phylogeny of the Core Malvales: Evidence from ndhF Sequence Data. American Journal of Botany , Vol. 86, No. 10 (Oct., 1999), pp. 1474-1486. Woolfe, M. L.; Chaplin, M. F.; Otchere, G. (1977) Studies on the mucilages extracted from okra fruits (Hibiscus esculentus L.) and baobab leaves (Adansonia digitata L.). Journal of the Science of Food and Agriculture 28: 519-529. This entry was posted in Flavor, Recipes, Uncategorized, Vegetables and tagged flavor, Katherine Preston, morphology, phylogenetic relationships, recipe, vegetable. Bookmark the permalink. Okra is beautiful both as plant and food. I always think of traditional cut rock hard candy of childhood when I slice it, so mucilage was never a focus anyhow. Thanks for making the chocolate connection through the mole recipe. Now to wonder if a beer pairing with a Dogfish Theobroma will add to the party or overwhelm it. Can’t hurt to try! What a great suggestion. 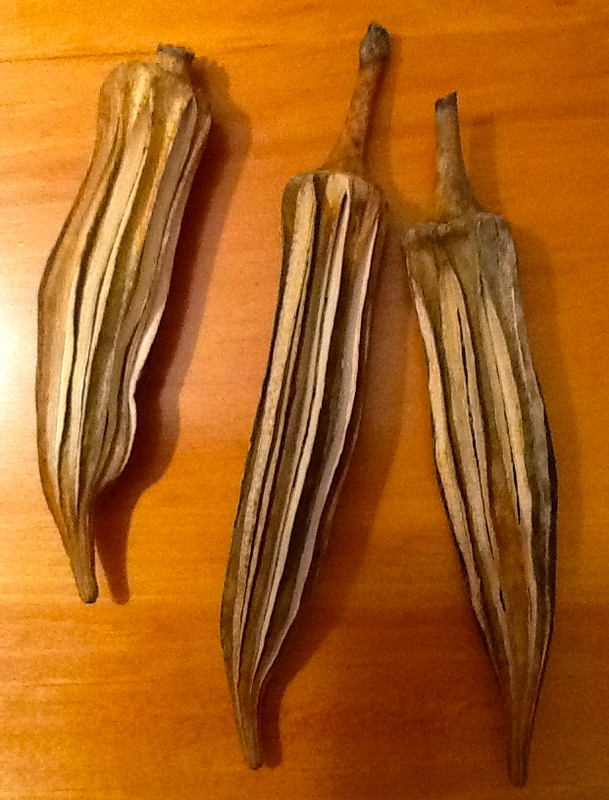 Someone in Britain a few years ago made a lot of money selling dried woody okra capsules as upmarket pot pourri/botanical stuff to put in ‘natural’ bowls. So they are at least good for something! This was my first year growing okra, and man, I loved having it to play with in my kitchen. Most of the time, I found myself just slicking the pods with olive oil and salt and throwing them on the grill. Yum. But okra mole–oh holy delicious recommendation! I look forward to trying it next summer. The variety I grew this year is called Burmese, and the pods could reach 8 inches long–maybe longer–and still be tender and delicious! When it comes to snottiness, molokhia (Corchorus olitorius) takes some beating. My wife comes from an Egyptian family but she can’t stand this national dish. It’s another mallow, of course. Do you know anything about the identity slime in members of the Basellaceae such as Ullucus and Anredera for example? What a great question. I don’t know much about the Basellaceae except that Malabar spinach is a member. When I lived in Bloomington, Indiana, there was a farmer’s market vendor there who sold that stuff, and I liked it’s moist texture and slight tang. Now I see that the family is related to other slimy succulents in the Caryophyllales (Cactaceae, Portulacaceae, Aizoaceae). Mucilage is a useful substance, so I’m not surprised. Thanks for the Malabar spinach memories. Fermented Okra, oh my! Cut them open if you want more slime. Well, as far as I know that would be nontoxic. The only thing I would do with the resulting goop would be to add it to a gumbo. As Jeanne implies, the resulting goop might not have terrific mouthfeel, but the nutritional profile shouldn’t suffer too much. You would not have digested the fibers anyhow. Pingback: Vendakkai Pachadi – Okra in a Spicy Tangy Coconut Gravy Why is Okra Slimy and What can you do?- Science in the Kitchen – T and Conversations! Chai with preethi!